As a proven entrepreneur and medical professional, Dr. Desai has established himself in the medical industry with varied career experiences, including Orthopedic Surgery training and practice in India as well as Internal Medicine training and practice in the U.S.
Dr. Desai has been a physician of internal medicine at Cross Creek Medical Clinic for the last 21 years, and continues to work for this private practice. 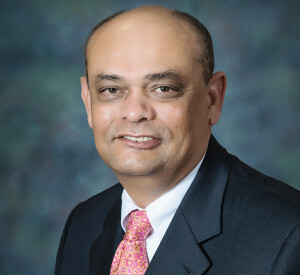 In addition to his many medical professional roles, he is also chief of medical staff at Cape Fear Valley Health System. Dr. Desai holds a MBBS from India and a Master of Surgery. in Orthopedics from The Maharaja Sayajirao University of Baroda. Dr. Desai completed his Internal Medicine residency at the Jamaica Hospital Medical Center in New York City.